What Can I Do If My Baby Was Deprived of Oxygen at Birth (HIE) in Arkansas? Hypoxic-ischemic encephalopathy (HIE) is the official term for the injury that occurs when a baby doesn’t get enough oxygen to their brain (oxygen deprivation at birth). This can happen in utero or during labor and delivery. In many cases, hypoxic-ischemic encephalopathy (HIE) is preventable, and it is the responsibility of medical professionals to avoid these preventable diagnoses. This is done when physicians follow standards of care and deliver the baby in a timely fashion when abnormalities in fetal heart rate are first detected. 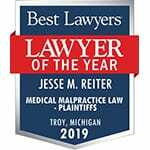 If your baby was diagnosed with hypoxic ischemic encephalopathy (HIE), call the experienced birth injury attorneys at Reiter & Walsh ABC Law Centers today at 888-419-2229. Our birth injury attorneys can help you with your Arkansas birth injury case, whether you are in Little Rock, Fort Smith, Fayetteville, Springdale, Jonesboro, Conway, Rogers, Pine Bluff, or another part of Arkansas. Because HIE is preventable, our team regularly handles HIE cases from numerous causes, including (but not limited to) ventouse (vacuum extraction) and forceps delivery, cords wrapped around the baby’s neck, improper delivery technique, delayed emergency C-section, infections, shoulder dystocia and improperly treated maternal health conditions. What does hypoxic-ischemic encephalopathy look like? Hypoxic-ischemic encephalopathy (HIE) has certain recognizable features that can be red flags for parents. Often, babies with hypoxic-ischemic encephalopathy (HIE) were born in a difficult birth. It is possible they were stuck in the birth canal, were in labor for an exceptionally long period of time, or needed resuscitation or an NICU stay after they were born. Babies with HIE usually have seizures (which can be identified using EEG monitoring), trouble with feeding, or may begin to miss developmental milestones as they get older. One of the key risk factors for HIE is a low Apgar score; a low Apgar score at birth can indicate that the baby is at risk of doing poorly. Parents can ask medical staff what their baby’s Apgar score is and talk to their doctor about what this means for their child. Early diagnosis is key. There is only one treatment for hypoxic-ischemic encephalopathy (HIE), and it must be administered within 6 hours of birth to be effective. This treatment, called hypothermia therapy (also known as brain cooling, whole-body cooling, or cooling therapy) allows the baby’s brain to repair itself to some extent as medical professionals lower the baby’s body temperature and metabolism, which slows down the ripple effect brain injury can produce. Hypothermia therapy has been proven to decrease the severity of disability, but must be administered within 6 hours – the sooner, the better. What can parents do if their child was diagnosed with Hypoxic Ischemic Encephalopathy (HIE) in Arkansas? Unfortunately, one of the most common trends we see at Reter & Walsh ABC Law Centers is that babies with HIE are not getting treatment in a timely fashion, meaning that critical treatment opportunities are being missed. If you begin to see that your child is not developing properly after a difficult birth, it is important to talk to an Arkansas birth injury attorney as soon as possible so you can secure funds for your child’s future care and medical expenses. This must be done within a certain time frame or the parent will not be able to pursue a case at all (a concept called the ‘statute of limitations’). Because these time frames vary significantly from state to state, it is best to ask an attorney directly about the specific circumstances of your case.